Robert D. Kaplan writes: "NATO's Article 5 offers little protection against Vladimir Putin's Russia," Iulian Fota, Romania's presidential national security adviser, told me on a recent visit to Bucharest. "Article 5 protects Romania and other Eastern European countries against a military invasion. But it does not protect them against subversion," that is, intelligence activities, the running of criminal networks, the buying-up of banks and other strategic assets, and indirect control of media organs to undermine public opinion. Moreover, Article 5 does not protect Eastern Europe against reliance on Russian energy. As Romanian President Traian Basescu told me, Romania is a somewhat energy-rich island surrounded by a Gazprom empire. The president ran his finger over a map showing how Romania's neighbors such as Bulgaria and Hungary were almost completely dependent on Russian natural gas, while Romania -- because of its own hydrocarbon reserves -- still has a significant measure of independence. In the 21st century, the president explained, Gazprom is more dangerous than the Russian army. The national security adviser then added: "Putin is not an apparatchik; he is a former intelligence officer," implying that Putin will act subtly. Putin's Russia will not fight conventionally for territory in the former satellite states, but unconventionally for hearts and minds, Fota went on. "Putin knows that the flaw of the Soviet Union was that it did not have soft power." Thus, Moscow's strategy is about taking over countries from within. In this battle, it is precisely during the quiet periods, when an issue like Ukraine drifts off the front pages because of the Middle East, for example, that we should be worried. And remember that weak democracies can be more useful to Russia than strong dictatorships. A ruthless communist autocrat such as Josip Broz Tito in Yugoslavia was able to keep the Soviets out of his country during the Cold War. But a feeble polity, however democratic, such as Romania's neighbor Moldova, offers the Russians many local politicians to bribe. With this in mind I traveled to Iasi on Romania's northeastern frontier with Moldova. There I met Iasi's county council president, Cristian Mihai Adomnitei, who reflected on how a relatively small group of Bolshevik conspirators had taken the great cities of Moscow and Saint Petersburg in November 1917. "Putin is heir to this tradition," Adomnitei said. "In his heart, he is a Bolshevik. He knows that you can conquer vast territories without big armies." Adomnitei took me inside Iasi's 19th-century National Theater, a little jewel dripping in gold leaf in celebration of the Rococo and Baroque styles, where Verdi's Traviata was to be performed in a few days. Alone with me in the empty theater, Adomnitei declared, "Here is Europe, here is its history and culture, its artistic values, and maybe soon its political values. Here is the borderland of the Habsburg Empire. We need your help to defend us." From Iasi I crossed the Prut River into Moldova -- historic Bessarabia, a territory that has been traded back and forth through the centuries between Romania and Russia but that, since the collapse of the Soviet Union in 1991, has been independent. Immediately the quality of the road deteriorated and the houses became marked by rust, scrap iron and undressed concrete -- like the Romania I had known from a generation before. I noticed that the houses along the road were connected to a natural gas pipeline network coming from Siberia, so that the quality of life was dependent upon Russia. Men and women in dusty fedoras and kerchiefs rolled by in leiterwagens, or wooden wagons. In the first town through which I passed, Ungheni, the park and sidewalks were devoured by weeds. Almost a quarter century after the Soviet Empire's collapse, its legacy lives on not only through underdevelopment but also through corruption -- which in Moldova is the overwhelming fact of political life that dares not speak its name, so that nationality questions receive all the prominence. Because of strong ethnic Russian, ethnic Ukrainian, ethnic Bulgarian and ethnic Turkic elements, and an ethnic Romanian majority that until the end of the Cold War had used the Cyrillic alphabet to read and write, Moldova's very identity is still somewhat an issue, the prime minister, Iurie Leanca, admitted to me in a long interview. Witness Balti, a city in northern Moldova, heralded by Soviet-era apartment buildings that resemble yellowing teeth. Here I met a local politician, Cecilia Graur, who told me that, "everyone is afraid. The situation in eastern Ukraine could happen here. We all know this because of our own divisions," political, ethnic and linguistic. "People talk about it all the time." Balti, with its pro-Russian sentiment, could become a Moldovan Donetsk, a Western diplomat warned me. While Graur was pro-European and spoke Romanian, Alexander Nesterovskii, another politician I met in Balti, was pro-Russian and spoke Russian. He said that local support for Putin represented a rational choice. "People could never afford to have Russia slow down natural gas deliveries or cease buying the region's agricultural products." Communism no longer meant Communism per se, but an advantageous economic relationship with Russia. Comrat, in southern Moldova, is home to the Christian Orthodox and Russian-speaking Turkic Gagauz -- a potential fifth column that Putin could use to undermine Moldova. Vitaliy Kyurkchu, a local Gagauz politician, told me that with 160,000 Gagauz in Moldova and 40,000 over the border in Ukraine, "we have ongoing kitchen discussions -- discussions mainly among ourselves, I mean -- about the creation of a Greater Gagauzia" should Moldova and Ukraine weaken or ever collapse. This was dangerous irredentism, of course. The Gagauz themselves are uncertain about their origins. Local identity is so complex that Georgetown's Charles King, among the leading experts in the field, calls nationality in Moldova a "decidedly negotiable proposition." 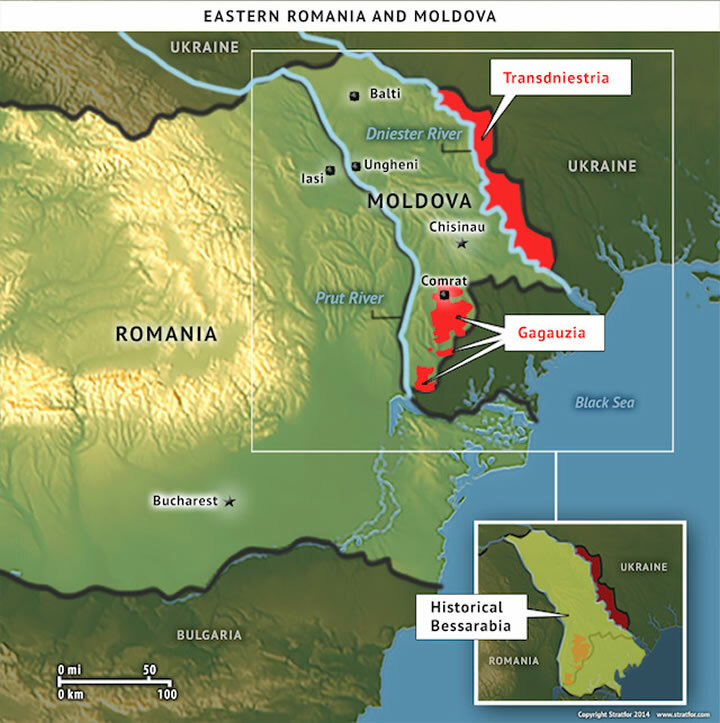 Then there is Transdniestria, a sliver of territory east of the Dniester River that is officially part of Moldova but that, with its heavily ethnic Russian population, seceded from Moldova after a brief war in the early 1990s. Transdniestria is now packed with Russian troops to act as a hammer against Moldova should the latter ever want to pivot toward the West. Transdniestria is the kind of legally murky, ill-defined smugglers' paradise that Putin wants to see multiply in eastern Ukraine. For weeks I traveled around Moldova. Indeed, the common theme everywhere was that Russia is a reality while the West is only a geopolitical concept. Ultimately, this is why even many of the ethnic Romanians are resigned to the fact that Russia must be engaged. I cannot help but recall the dark political landscape in Yugoslavia while reporting there in the 1980s in advance of the violent breakup of that country in the 1990s. My writing apparently helped influence a White House policy of inaction from 1993 to 1995. Yet it is only the darkest landscapes where intervention is ever required in the first place: You should know the worst about a place before you craft the most humanistic policy toward it. I am not here providing a fully fleshed-out policy toward Moldova or the other states facing Russia. I am saying only that there are incalculable human costs to Western inaction. And Western action must mean a whole-of-government approach -- political, intelligence, economics and so forth -- in order to counter what the Russians are doing. Time may be short. Russian officials have reportedly held meetings with Moldova's ethnic minorities to get them to demand even more autonomy after Moldova goes ahead with the association agreement with the European Union signed at the end of June. The Russians know that Moldova is more than just a borderland: It is an unwieldy mix of peoples constituting multiple borderlands within a small and weak state. I fear for Moldova. "Why Moldova Urgently Matters is republished with permission of Stratfor."